I was terrified of this film as a kid; the flying monkeys were just too much to handle. And then there’s the witch, her cackle, the red smoke, that creepy forest, the Winkie guards; I don’t even remember how old I was, I just remember that I was scared. I didn’t want to show the movie to my kids until I thought they were ready, because I was afraid it would give them nightmares, but my wife talked me into it. And good thing too, they absolutely loved it, obviously they’re much braver than I. They also are able to appreciate musicals in a way that most children don’t, which I am very proud of, this feature not withstanding. It’s one of the greatest movie musicals of all time, and watching it as an adult, or at any age, it’s obvious to see why. Dorothy Gale is a young girl from Kansas who lives with her Aunt Em & Uncle Henry. She has her dog, her big dreams, and her freedom to run about, but she is torn between wanting to stay where she is and wanting to see the special places the world has to offer. Her decision is made for her when her dog Toto is taken by the evil Miss Gulch, forcing Dorothy to run away, once Toto escapes and comes home. But a giant twister smashes its way through the countryside, apparently transporting Dorothy and her dog to the magical land of Oz. There, after she accidentally kills the Wicked Witch of the East, she begins a journey to find the Emerald City and its famed Wizard of Oz, who has the power to send her back home. The friends she meets along the way and the lessons she learns through time will mold her until the girl who returns to Kansas isn’t the same one that left. I was in the stage version of this story in high school; I was the Tin Man. It’s a great show, so fun, and I still remember the songs I sang and even some of the dances. Watching the movie is just as wonderful as seeing the stage production; it’s a show filled with incredible music and iconic moments, pieces of art history that changed the way we create. To think that this movie came out before WWII, that it was as polished and complicated as it was, for being 80 years old, it really is impressive in a way that few films have ever accomplished. And I’m happy to report that the flying monkeys released their hold on me; I am no longer scared. 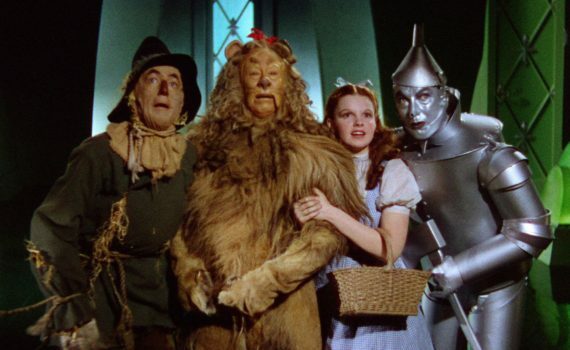 The kooky characters, the vibrant colors, the timeless songs, the bits of trivia that pop up around every corner; The Wizard of Oz is a pillar of cinema, and I don’t think that will ever change.